Millie Slavidou is a writer of children's literature. Her blog Glossologics is a glorious mix of amusing tales of phrasal verbs and etymology. According to her Twitter bio, she is a walking dictionary, a lover of etymology and a chocolate cake aficionado. I recently discovered that Millie is also the mum of a child with special needs and she currently resides in Greece. Now Greece and children with special needs have been on our minds, on our lips and in our newspapers a lot of late. You have heard of the human rights violations occurring in their institutions, with stories of children locked in cages being the 'lucky' ones. Others are reported to be tied to their beds 'for their own safety'. And all this while state of the art facilities lie empty because the government cannot afford to staff and run them. As parents of children with additional needs or disabilities we cannot comprehend this. As a community we are trying all we can to improve this situation. As human beings we are incredulous. Perhaps you have signed the ePetition here? 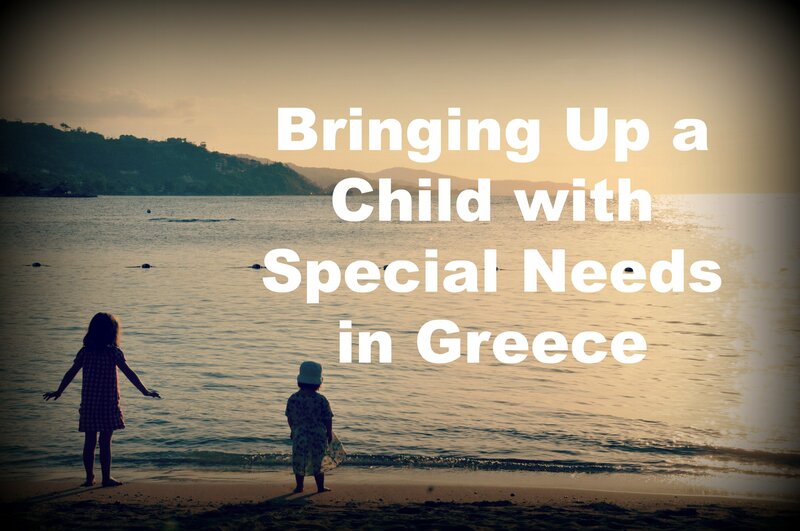 Millie has no experience of the atrocious conditions described in these institutions, but I asked her to share her experiences of bringing up a child with special needs in Greece and the challenges and obstacles that she has found. Millia asks if her government simply does not care, or is making their lives difficult on purpose. Much has been said about the lives of people with disabilities in Greece in the last few weeks. I cannot speak for those living in institutions, as I have no experience of that. I can, however, tell you about the trials of bringing up a child with special needs in Greece. In the first few years, you don’t really notice the problems. It was difficult to pay for aspects of my son’s care that were not covered by the health service, such as his physiotherapy and later his occupational therapy, but as there are many aspects of healthcare that are now no longer covered, I didn’t see this as being an issue solely for disabled people. Of course, it does affect the disabled disproportionately, but at the time, I just accepted it. The first time I really felt the discrimination was when I wished to enroll my son in nursery. I went to the same state-run nursery that his older siblings had attended, and was turned away. They told me that they do not accept any children with special needs. I did not expect an ordinary nursery to provide specialist care or administer medication – obviously, that is not within their remit. But my son required neither. He did not walk at the time and was completely non-verbal, but some of the other children also spoke very little, and changing a nappy should be the same process for any child, whether they can walk or not! I later heard from the mother of another little boy that her son had been initially accepted at the nursery, but asked to leave as soon as his autism became apparent to the staff. Ours is a bilingual family, with Greek and English. From the very beginning, against the evidence of all studies, I was advised to stop speaking English to my son on the grounds of his special needs. Things came to a head when his specialist at the Mental Health Centre refused to refer him for much-needed speech therapy on the grounds that we were bilingual, so it wouldn’t be any use. I had to fight to get a different person to sign the document that would allow him to have speech therapy. A year later, and I am happy to say that it has greatly benefitted him and he has started to say a few words. The Mental Health Centre has been a source of a lot of trouble for us. In order to get an appointment, we are required to fill in a form at reception. Twice I have filled in the form only for it to be completely ignored. Phonecalls are not returned. And that is before I even mention the location – on the first floor of a building with no lift and extremely steep steps. My son is fortunately able to walk a little bit, but he cannot manage steps and I have to carry him up. Children with special needs have a right to education, and there are special schools as well as integration units within mainstream schools in order to cater for them. In order to attend one of these, you must first be seen and assessed by KEDDY, a small committee of people who decide where would be the best place for the child. At least, that is what is supposed to happen. In reality, KEDDY ignore reports from the child’s medical team. They ignore recommendations from speech therapists, occupational therapists, child psychologists and so on and so forth. I cannot be sure exactly what they base their decisions on, but I cannot help but suspect that it is with an eye on cost cutting. To prove my point – support workers, who are supposed to attend to the physical needs of children with special needs, have only just started to arrive at the schools. Up to now, if there was anything related to bodily needs, such as changing a nappy, the school would ring the parents to come in. My son is now toilet trained, but like any small child, he has accidents. I was called into the school a few weeks ago because he had wet himself and needed to change his clothes. He takes a bag of fresh clothes into school every day, but I don’t know why, since they ask me to go in and change him anyway. This means that a child has to sit there, wet or soiled, until the parent arrives. It also affects the parents’ employment – who is going to employ someone that has to be on constant standby to rush in to school?! Out and about for disabled people can be a real trial. Greek drivers park their cars all over the pavements, and even when they can’t because there are trees or bollards along the edge, it almost goes without saying that they park across the ramps for the disabled. Where there are ramps, that is, as most pavements don’t have them anyway. I have never ever seen a car parked up on the pavement or across a ramp receive a ticket. Disabled children are supposed to receive benefits – this is important, as we have to pay so much healthcare from our own pockets. We asked at the Mental Health Clinic and the doctor waved us away, saying that she couldn’t determine the percentage of my son’s disability. Again, we had to fight to even be examined. The amount of paperwork required is incredible, and the number of doctors required to sign and stamp the same document in order to do anything, from speech therapy to physio to getting an appointment just to be considered for disability benefit is frankly ridiculous. Added to which, most of the offices close at 2pm, which means days off work just to get documents signed and stamped. Let’s take the example of our referral for speech therapy. I had to take my son into the hospital outpatients, where the mental health team work only on one day a week, as it was difficult to get an appointment at the clinic (my completed form had been ignored, and of course, there are the steps). We saw the doctor, who gave us a referral. This had to be taken to the head of department to be signed and stamped. Another wait. Then we had to take the paper to another office in the hospital to be signed and stamped. Another queue. Then it had to go to the central office of the health care organization in town, (on the 6th floor, naturally) where a doctor who had never even seen my son signed and stamped it without even looking at it. Only then could I take it to the speech therapist. So, in general, you get the impression that the government either simply does not care, or actively tries to make our lives harder.